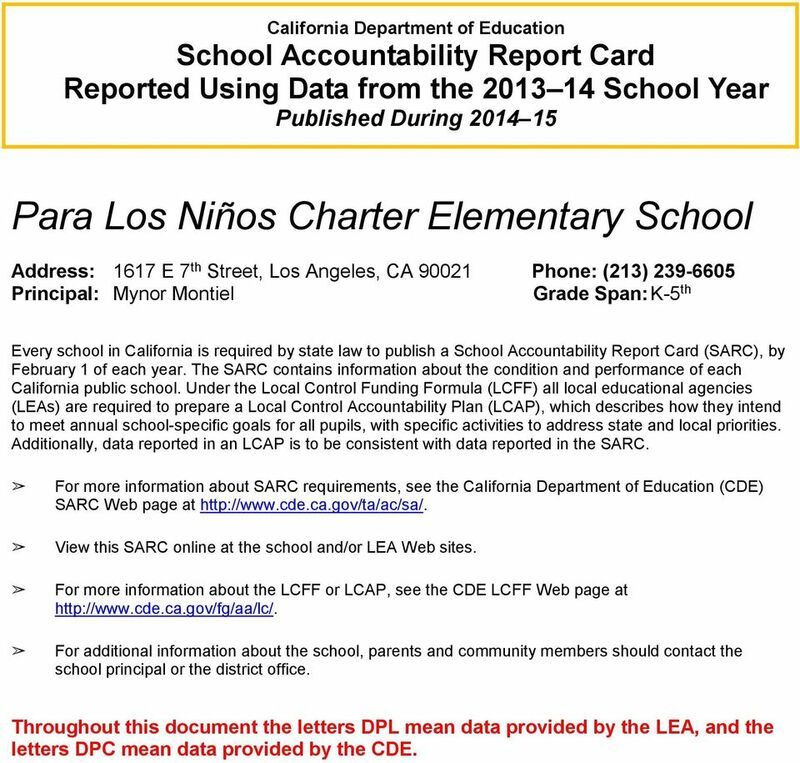 Download "Para Los Niños Charter Elementary School"
1 California Department of Education School Accountability Report Card Reported Using Data from the School Year Published During Para Los Niños Charter Elementary School Address: 1617 E 7 th Street, Los Angeles, CA Phone: (213) Principal: Mynor Montiel Grade Span: K-5 th Every school in California is required by state law to publish a School Accountability Report Card (SARC), by February 1 of each year. 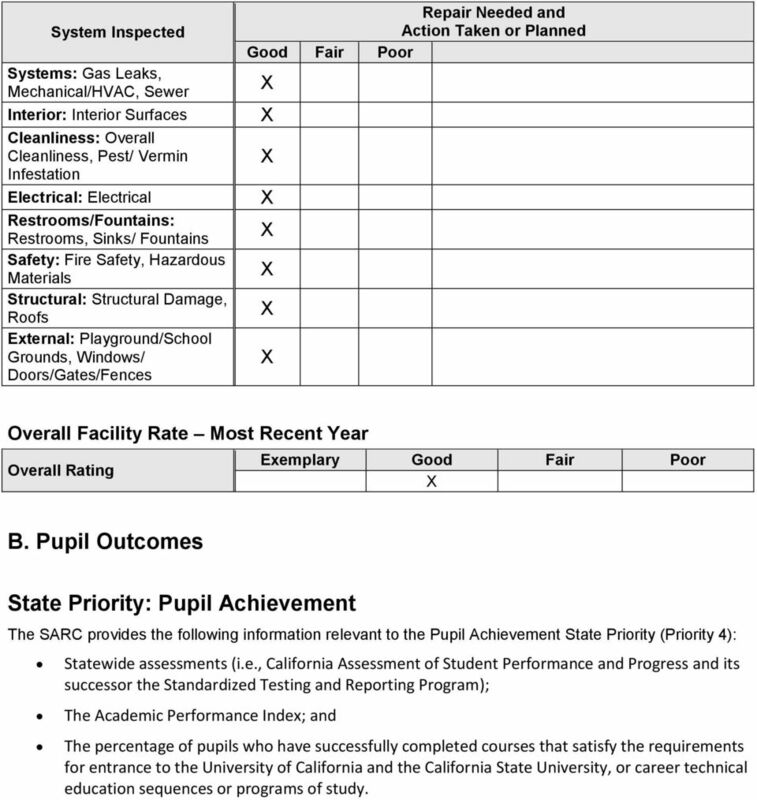 The SARC contains information about the condition and performance of each California public school. Under the Local Control Funding Formula (LCFF) all local educational agencies (LEAs) are required to prepare a Local Control Accountability Plan (LCAP), which describes how they intend to meet annual school-specific goals for all pupils, with specific activities to address state and local priorities. 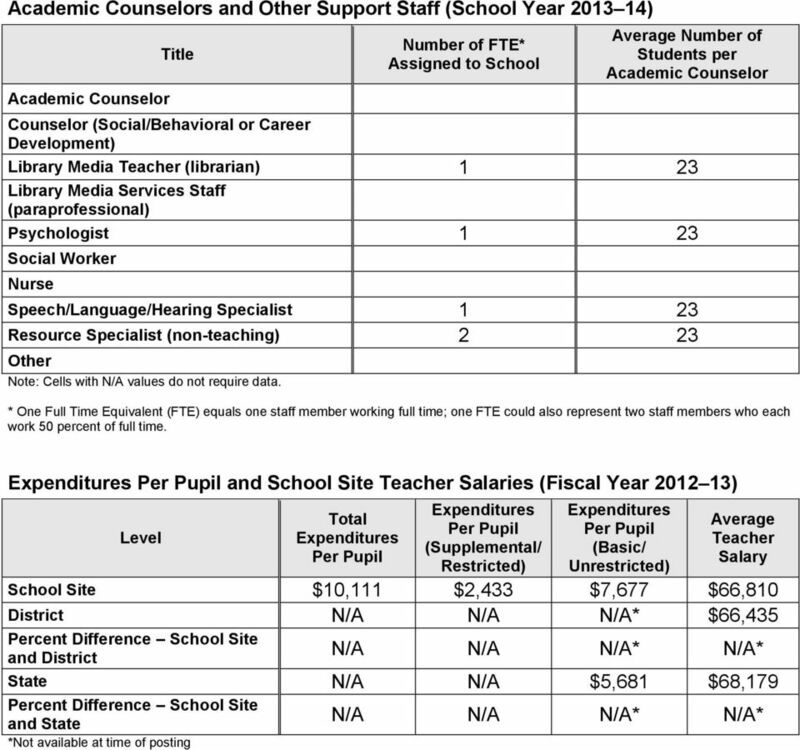 Additionally, data reported in an LCAP is to be consistent with data reported in the SARC. For more information about SARC requirements, see the California Department of Education (CDE) SARC Web page at View this SARC online at the school and/or LEA Web sites. For more information about the LCFF or LCAP, see the CDE LCFF Web page at For additional information about the school, parents and community members should contact the school principal or the district office. Throughout this document the letters DPL mean data provided by the LEA, and the letters DPC mean data provided by the CDE. 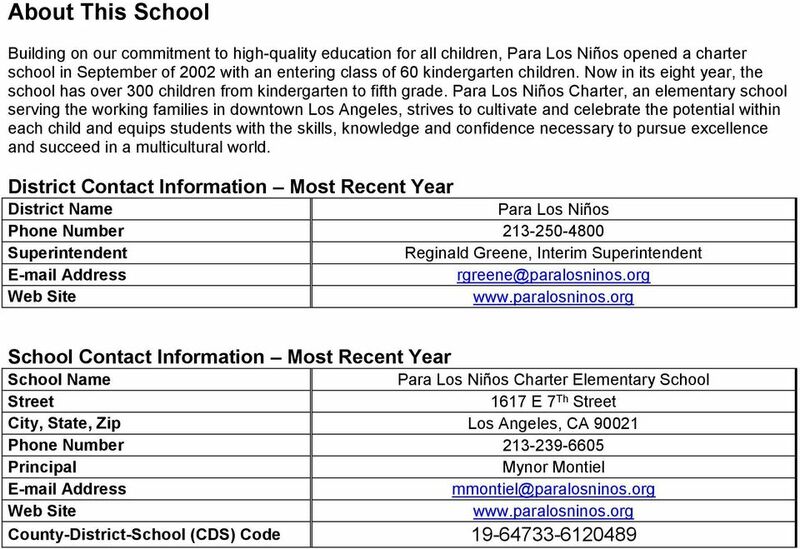 3 School Description and Mission Statement Most Recent Year The Para Los Niños Charter School, an elementary school serving the children of working families in downtown Los Angeles, strives to cultivate and to celebrate the potential within each child and equip students with the skills, knowledge and confidence necessary to pursue excellence and succeed in a multicultural world. The School provides a nurturing, safe environment that inspires critical thinking, imagination, self-reliance and respect for others. 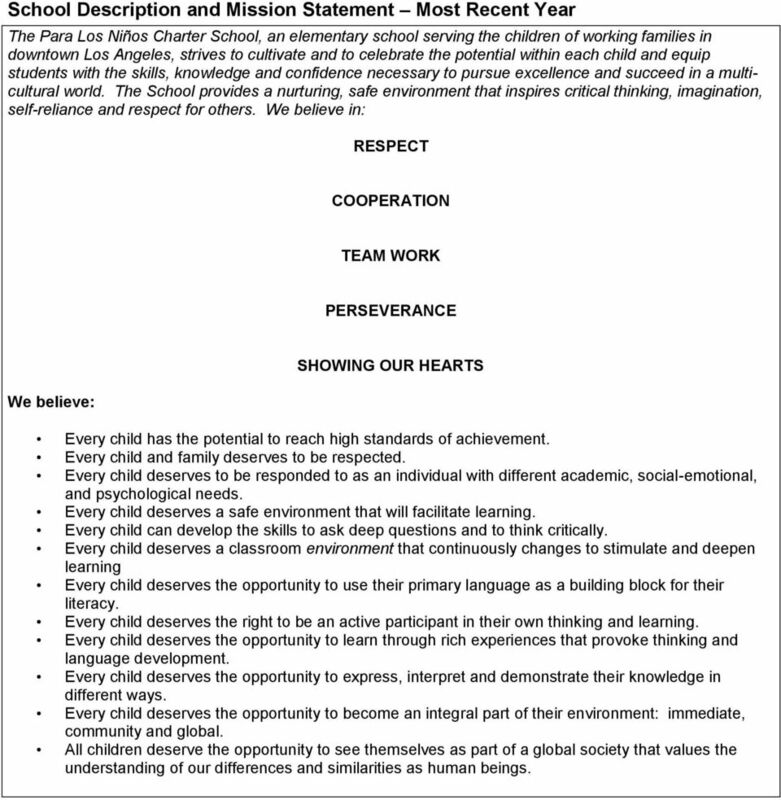 We believe in: RESPECT COOPERATION TEAM WORK PERSEVERANCE We believe: SHOWING OUR HEARTS Every child has the potential to reach high standards of achievement. Every child and family deserves to be respected. Every child deserves to be responded to as an individual with different academic, social-emotional, and psychological needs. Every child deserves a safe environment that will facilitate learning. Every child can develop the skills to ask deep questions and to think critically. Every child deserves a classroom environment that continuously changes to stimulate and deepen learning Every child deserves the opportunity to use their primary language as a building block for their literacy. Every child deserves the right to be an active participant in their own thinking and learning. Every child deserves the opportunity to learn through rich experiences that provoke thinking and language development. Every child deserves the opportunity to express, interpret and demonstrate their knowledge in different ways. Every child deserves the opportunity to become an integral part of their environment: immediate, community and global. All children deserve the opportunity to see themselves as part of a global society that values the understanding of our differences and similarities as human beings. 4 Student Enrollment by Grade Level (School Year ) Grade Level Number of Students Kindergarten 88 Grade 1 64 Grade 2 70 Grade 3 68 Grade 4 53 Grade 5 51 Grade 6 0 Grade 7 0 Grade 8 0 Ungraded Elementary 0 Grade 9 0 Grade 10 0 Grade 11 0 Grade 12 0 Ungraded Secondary 0 Total Enrollment 398 Student Enrollment by Student Group (School Year ) Group Percent of Total Enrollment Black or African American 0 American Indian or Alaska Native 0 Asian 0 Filipino 0 Hispanic or Latino 99.75% Native Hawaiian or Pacific Islander 0 White 0.25 % Two or More Races 0.25% Socioeconomically Disadvantaged 81.65% English Learners 60.30% Students with Disabilities 5.7% A. Conditions of Learning State Priority: Basic The SARC provides the following information relevant to the Basic State Priority (Priority 1): Degree to which teachers are appropriately assigned and fully credentialed in the subject area and for the pupils they are teaching; Pupils have access to standards-aligned instructional materials; and School facilities are maintained in good repair. 5 Teacher Credentials Teachers School School School District With Full Credential Without Full Credential Teaching Outside Subject Area of Competence (with full credential) Teacher Misassignments and Vacant Teacher Positions Indicator Misassignments of Teachers of English Learners Total Teacher Misassignments* Vacant Teacher Positions Note: Misassignments refers to the number of positions filled by teachers who lack legal authorization to teach that grade level, subject area, student group, etc. * Total Teacher Misassignments includes the number of Misassignments of Teachers of English Learners. 7 System Inspected Systems: Gas Leaks, Mechanical/HVAC, Sewer Interior: Interior Surfaces Cleanliness: Overall Cleanliness, Pest/ Vermin Infestation Electrical: Electrical Restrooms/Fountains: Restrooms, Sinks/ Fountains Safety: Fire Safety, Hazardous Materials Structural: Structural Damage, Roofs External: Playground/School Grounds, Windows/ Doors/Gates/Fences Repair Needed and Action Taken or Planned Good Fair Poor Overall Facility Rate Most Recent Year Overall Rating Exemplary Good Fair Poor B. Pupil Outcomes State Priority: Pupil Achievement The SARC provides the following information relevant to the Pupil Achievement State Priority (Priority 4): Statewide assessments (i.e., California Assessment of Student Performance and Progress and its successor the Standardized Testing and Reporting Program); The Academic Performance Index; and The percentage of pupils who have successfully completed courses that satisfy the requirements for entrance to the University of California and the California State University, or career technical education sequences or programs of study. 8 California Assessment of Student Performance and Progress/ Standardized Testing and Reporting Results for All Students in Science Three-Year Comparison Subject Science (grades 5, 8, and 10) Percent of Students Scoring at Proficient or Advanced (meeting or exceeding the state standards) School District State % 40% 33% Note: Science assessments include California Standards Tests (CSTs), California Modified Assessment (CMA), and California Alternate Performance Assessment (CAPA). Note: Scores are not shown when the number of students tested is ten or less, either because the number of students in this category is too small for statistical accuracy or to protect student privacy. 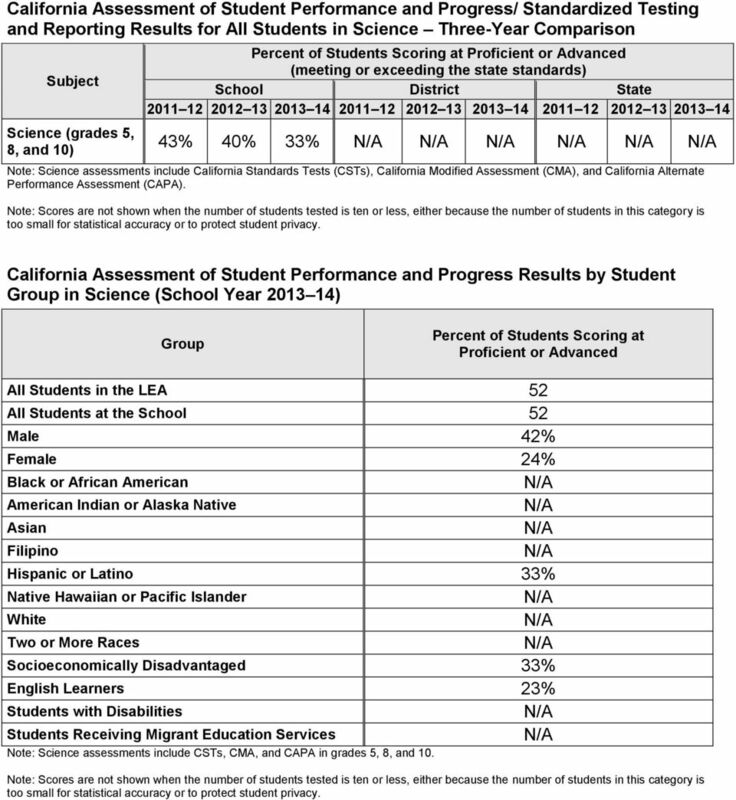 California Assessment of Student Performance and Progress Results by Student Group in Science (School Year ) Group Percent of Students Scoring at Proficient or Advanced All Students in the LEA 52 All Students at the School 52 Male 42% Female 24% Black or African American American Indian or Alaska Native Asian Filipino Hispanic or Latino 33% Native Hawaiian or Pacific Islander White Two or More Races Socioeconomically Disadvantaged 33% English Learners 23% Students with Disabilities Students Receiving Migrant Education Services Note: Science assessments include CSTs, CMA, and CAPA in grades 5, 8, and 10. Note: Scores are not shown when the number of students tested is ten or less, either because the number of students in this category is too small for statistical accuracy or to protect student privacy. 9 Standardized Testing and Reporting Results for All Students Three-Year Comparison Subject English-Language Arts Percent of Students Scoring at Proficient or Advanced (meeting or exceeding the state standards) School District State % 43.7% 41% 41% 58.1% Mathematics 55.4% 61.3% 67.3% 39% 59.5% History-Social Science Note: STAR Program was last administered in Percentages are not calculated when the number of students tested is ten or less, either because the number of students in this category is too small for statistical accuracy or to protect student privacy. 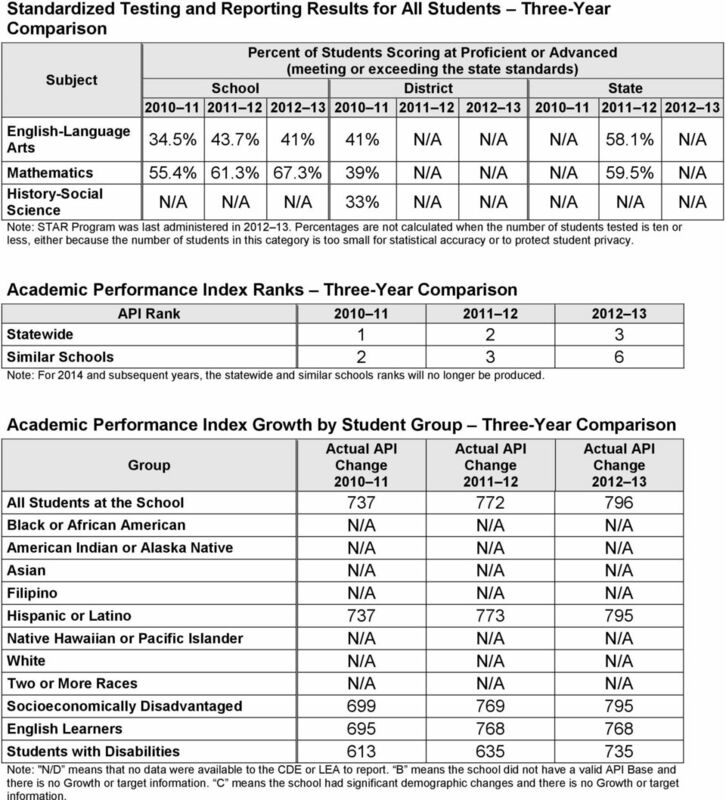 33% Academic Performance Index Ranks Three-Year Comparison API Rank Statewide Similar Schools Note: For 2014 and subsequent years, the statewide and similar schools ranks will no longer be produced. Academic Performance Index Growth by Student Group Three-Year Comparison Group Actual API Change Actual API Change Actual API Change All Students at the School Black or African American American Indian or Alaska Native Asian Filipino Hispanic or Latino Native Hawaiian or Pacific Islander White Two or More Races Socioeconomically Disadvantaged English Learners Students with Disabilities Note: "N/D means that no data were available to the CDE or LEA to report. B means the school did not have a valid API Base and there is no Growth or target information. C means the school had significant demographic changes and there is no Growth or target information. 10 State Priority: Other Pupil Outcomes The SARC provides the following information relevant to the Other Pupil Outcomes State Priority (Priority 8): Pupil outcomes in the subject areas of English, mathematics, and physical education. 11 California Physical Fitness Test Results (School Year ) Grade Level Percent of Students Meeting Four of Six Fitness Standards Percent of Students Meeting Five of Six Fitness Standards Percent of Students Meeting Six of Six Fitness Standards % 21.2% 26.9% 7 9 Note: Percentages are not calculated when the number of students tested is ten or less, either because the number of students in this category is too small for statistical accuracy or to protect student privacy. 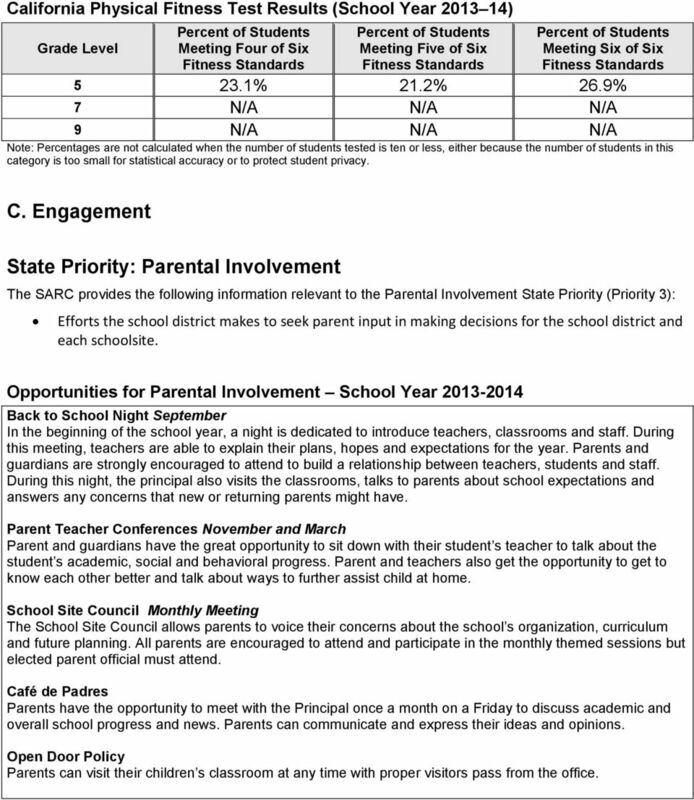 C. Engagement State Priority: Parental Involvement The SARC provides the following information relevant to the Parental Involvement State Priority (Priority 3): Efforts the school district makes to seek parent input in making decisions for the school district and each schoolsite. Opportunities for Parental Involvement School Year Back to School Night September In the beginning of the school year, a night is dedicated to introduce teachers, classrooms and staff. During this meeting, teachers are able to explain their plans, hopes and expectations for the year. Parents and guardians are strongly encouraged to attend to build a relationship between teachers, students and staff. During this night, the principal also visits the classrooms, talks to parents about school expectations and answers any concerns that new or returning parents might have. Parent Teacher Conferences November and March Parent and guardians have the great opportunity to sit down with their student s teacher to talk about the student s academic, social and behavioral progress. Parent and teachers also get the opportunity to get to know each other better and talk about ways to further assist child at home. School Site Council Monthly Meeting The School Site Council allows parents to voice their concerns about the school s organization, curriculum and future planning. All parents are encouraged to attend and participate in the monthly themed sessions but elected parent official must attend. Café de Padres Parents have the opportunity to meet with the Principal once a month on a Friday to discuss academic and overall school progress and news. Parents can communicate and express their ideas and opinions. Open Door Policy Parents can visit their children s classroom at any time with proper visitors pass from the office. 13 School Safety Plan Most Recent Year In the event of an emergency situation, the school Principal shall declare an emergency situation and institute the appropriate response actions. In the event that the Principal is not available, the next person in authority shall assume the responsibilities of the Principal. Principal: Mynor Montiel Alternate: Celeste Ruano 1. Work with PLN Crisis Management Team and local emergency agencies to arrange for evacuation location and transportation away from the school. 2. Familiarize all staff with the crisis/emergency preparedness plan and ensure effective implementation. 3. Ensure that the School s practice drill program is implemented and documented. 4. Ensure supplies and equipment are present and checked at least monthly. 5. Review each crisis/emergency situation to ensure that proper reports are completed and appropriate action is taken to prevent repetition of any ineffective efforts. 6. Act as team leader in a crisis/emergency situation. Identify the emergency situation and determine the course of action. 7. Activate contact with PLN Crisis Management Team and or other local authorities to inform School of potential or existing crisis/emergency situation. Next in Charge: Cecilia Hernandez Alternate: David Tanaka The responsibilities of the person next in charge are to assist the Principal during an emergency, and in the absence of the Principal assume all responsibilities. 1. Become familiar with the crisis/emergency preparedness plan. 2. Provide complete crisis/emergency response training to employees on a regular basis and updates as necessary. 3. Take the lead in planning, implementing, and tracking all training to update and check the accuracy of current crisis/emergency response procedures. 4. Work with the school Principal to investigate and evaluate each crisis/emergency situation to prevent repetition of ineffective efforts. 5. 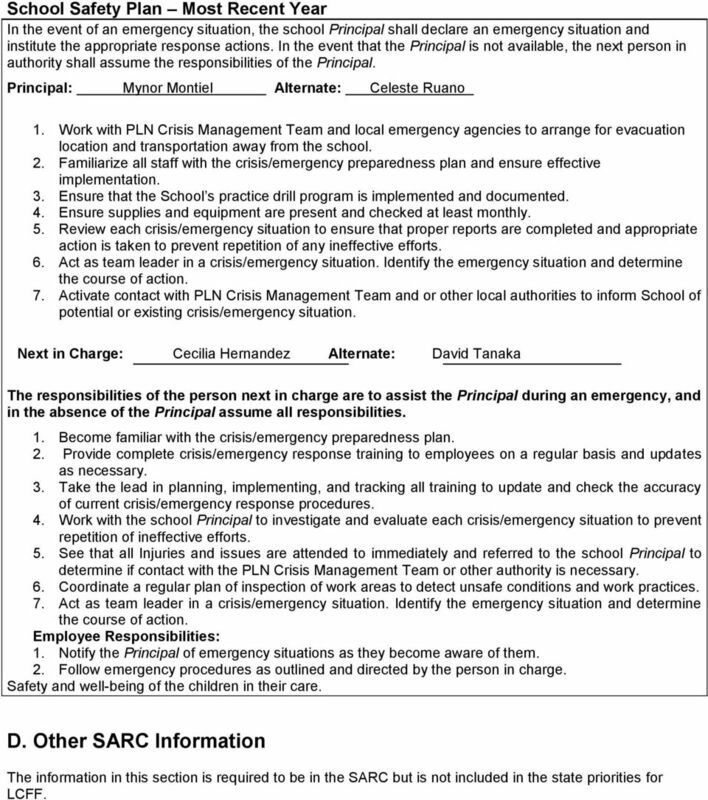 See that all Injuries and issues are attended to immediately and referred to the school Principal to determine if contact with the PLN Crisis Management Team or other authority is necessary. 6. Coordinate a regular plan of inspection of work areas to detect unsafe conditions and work practices. 7. Act as team leader in a crisis/emergency situation. Identify the emergency situation and determine the course of action. Employee Responsibilities: 1. Notify the Principal of emergency situations as they become aware of them. 2. Follow emergency procedures as outlined and directed by the person in charge. Safety and well-being of the children in their care. D. Other SARC Information The information in this section is required to be in the SARC but is not included in the state priorities for LCFF. 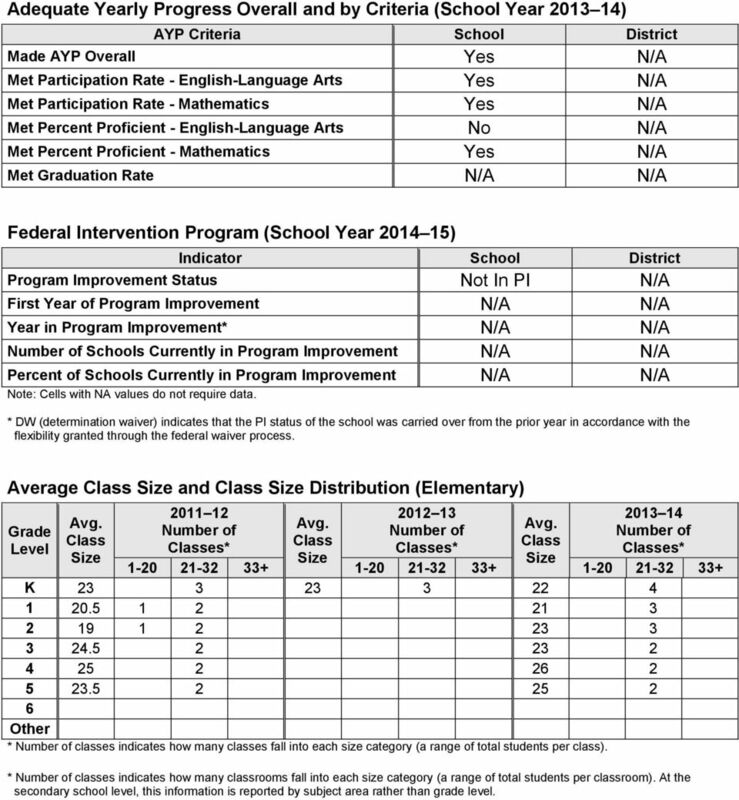 14 Adequate Yearly Progress Overall and by Criteria (School Year ) AYP Criteria School District Made AYP Overall Yes Met Participation Rate - English-Language Arts Yes Met Participation Rate - Mathematics Yes Met Percent Proficient - English-Language Arts No Met Percent Proficient - Mathematics Yes Met Graduation Rate Federal Intervention Program (School Year ) Indicator School District Program Improvement Status Not In PI First Year of Program Improvement Year in Program Improvement* Number of Schools Currently in Program Improvement Percent of Schools Currently in Program Improvement Note: Cells with NA values do not require data. * DW (determination waiver) indicates that the PI status of the school was carried over from the prior year in accordance with the flexibility granted through the federal waiver process. 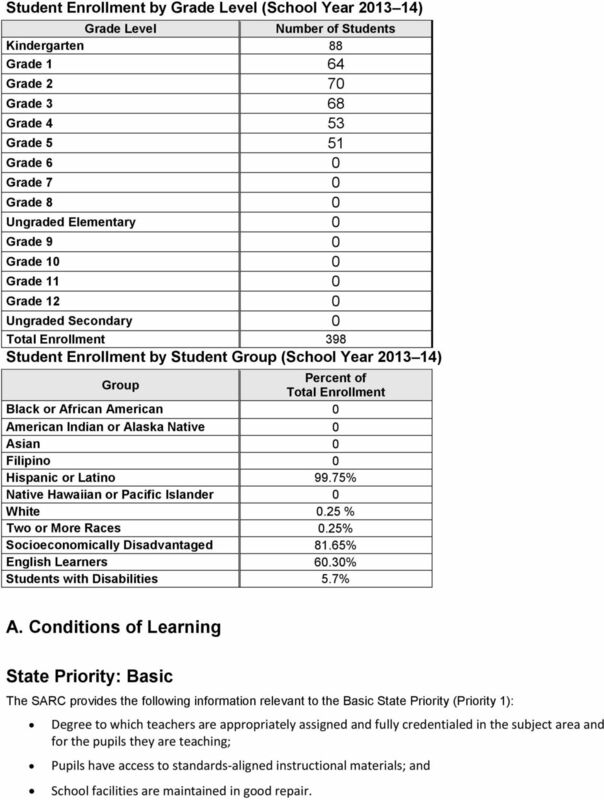 Average Class Size and Class Size Distribution (Elementary) Grade Level Avg. Class Size Number of Classes* Avg. Class Size Number of Classes* Avg. Class Size Number of Classes* K Other * Number of classes indicates how many classes fall into each size category (a range of total students per class). * Number of classes indicates how many classrooms fall into each size category (a range of total students per classroom). 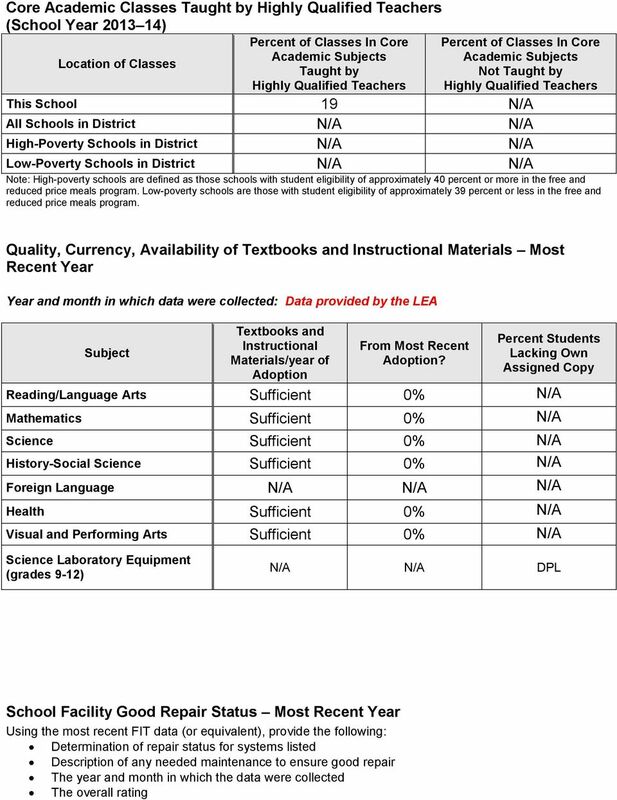 At the secondary school level, this information is reported by subject area rather than grade level. 16 Types of Services Funded (Fiscal Year ) NCLB:T1Part A, Basic Grts Low-Income & Neglected NCLB: TII Part A, Teacher Quality NCLB: TV Part A Innovative Education Strategies Child Nutrition Program (School lunch and breakfast programs). Special Education Title III Title III funds assist English Learners (EL) in acquiring English fluency, gaining access to the curriculum, achieving grade-level and graduation standards. Funds are distributed to school sites based on the number of EL students enrolled. 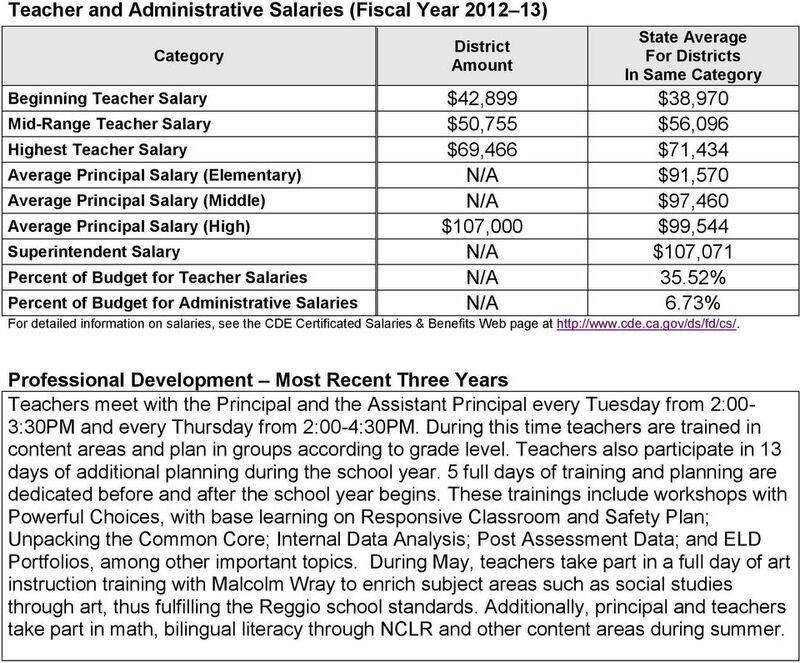 17 Teacher and Administrative Salaries (Fiscal Year ) Category District Amount State Average For Districts In Same Category Beginning Teacher Salary $42,899 $38,970 Mid-Range Teacher Salary $50,755 $56,096 Highest Teacher Salary $69,466 $71,434 Average Principal Salary (Elementary) $91,570 Average Principal Salary (Middle) $97,460 Average Principal Salary (High) $107,000 $99,544 Superintendent Salary $107,071 Percent of Budget for Teacher Salaries 35.52% Percent of Budget for Administrative Salaries 6.73% For detailed information on salaries, see the CDE Certificated Salaries & Benefits Web page at Professional Development Most Recent Three Years Teachers meet with the Principal and the Assistant Principal every Tuesday from 2:00-3:30PM and every Thursday from 2:00-4:30PM. During this time teachers are trained in content areas and plan in groups according to grade level. Teachers also participate in 13 days of additional planning during the school year. 5 full days of training and planning are dedicated before and after the school year begins. These trainings include workshops with Powerful Choices, with base learning on Responsive Classroom and Safety Plan; Unpacking the Common Core; Internal Data Analysis; Post Assessment Data; and ELD Portfolios, among other important topics. During May, teachers take part in a full day of art instruction training with Malcolm Wray to enrich subject areas such as social studies through art, thus fulfilling the Reggio school standards. Additionally, principal and teachers take part in math, bilingual literacy through NCLR and other content areas during summer.